Normal service will shortly be resumed – 17 Apr 2014. Well, I’ve done my duty and sanded and refinished the living room parquet floor. This means I’ll be able to get back in the fettling shed soon. I managed to get out on my other bike this afternoon. 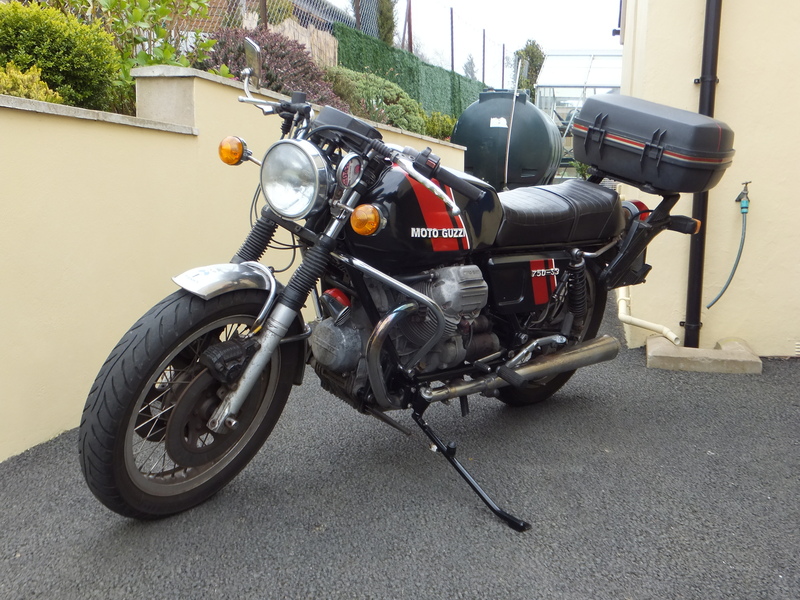 It’s a mongrel 750S3 with bits of 850T3 and T4 plus some V7Sport bits thrown in. It’s now gained a Cali side stand. I was warned this big stand might scrape the tarmac in bends but there seems to be plenty of clearance to me. My other bike. A modified 750S3. Nice shiny bits – 8 Apr 2014. I collected my parts from the powder coater today. They are now residing on my nice clear bench so I can go and look at them from time to time! I’m too busy sanding and refinishing parquet flooring to have any garage time. I’m pleased with how they have turned out. The frame and swing arm are silver and the stands, battery tray etc are gloss black. The parts for the instrument cluster are in satin black. I’ve had the footrest hangers finished in powder coat as the original zinc plate on them was long gone. I didn’t think they were good enough to replate. 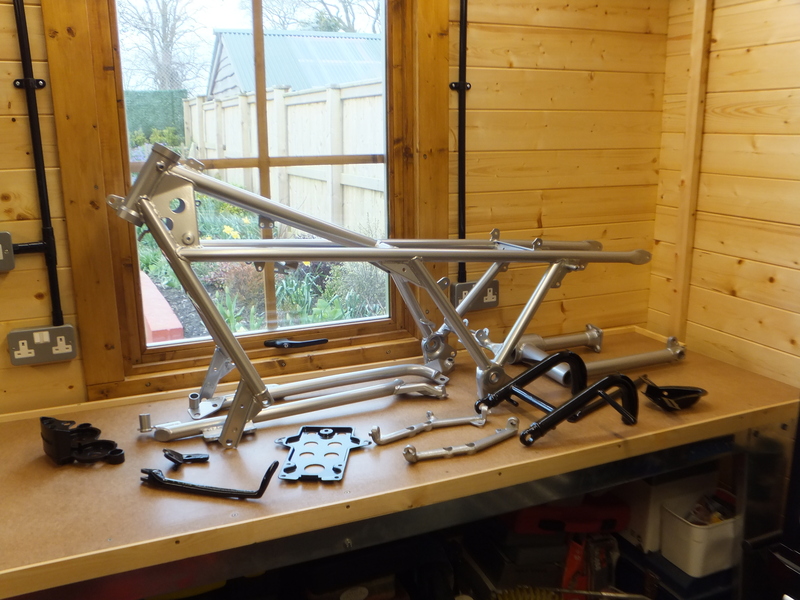 While I was at it, I had the big side stand and frame rail for the S3 done at the same time. I had the work done by AWP Engineering in Pembrokeshire who were helpful, friendly and had it all done in a week. They masked all the threads and bearing lands properly and made sure nothing got lost! The bonus was that they are just under an hour away. I wasn’t keen on sending my stuff to the Midlands. As it’s all DIY for the moment, I won’t be able to make much progress with Rhino for now. I’m making a shopping list of parts needed. Unfortunately they’re all the expensive ones. Quick update – 4 Apr 2014. Time I gave a little update. The decision has been made. The bike will be burgundy red with a silver frame. There’s no going back now. 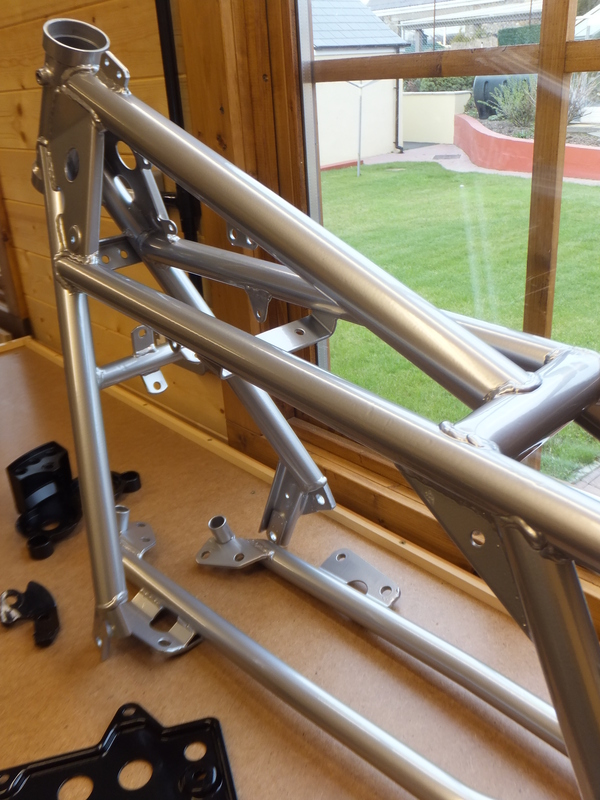 The frame is at the powder coater to be done silver and other parts like the stands etc to be black. What has been taxing me is the actual burgundy paint colour. I’ve searched t’interweb, consulted web forums and my contacts and can’t come up with a definitive code for the colour. There is something on the AnimaGuzzista site about the formula having been lost, or I think that’s what it says. I’m relying on google translate here. I’ll keep looking as there’s plenty else to be getting on with for now. I still need some replacement parts and there is all the chroming and polishing to sort out. There won’t be any actual progress with the bike for at least a week as I’ve got some house DIY that’s got to be done. Also I’m finishing off putting the big ugly Cali sidestand on the S3. Fully loaded, it rolled off the stand last summer. Hopefully I will be going to the Classic Bike Show at Stafford toward the end of the month.